There is a cliché which dictates that, when you re-read a classic book and have a different experience, it is not the book that has changed, but you. A similar mechanic is at work on Drudkh‘s latest album, Borozna obirvalasya, or A furrow cut short in English. After nearly a decade of attempts to emulate the naturalistic delights of Autumn aurora (2004) and experimenting with folk and post-rock, A furrow cut short represents a return to Drudkh‘s undisputed magnum opus, Blood in our wells. Once again Drudkh walks on the edge of melodrama, creating a record that comments on the contemporary state of their native Ukraine in the most elegant, subtle fashion imaginable. While both records have in common that they reflect upon tragedies that have befallen Ukraine (be they general gentrification or the accute threat of annihilation), A furrow cut short is obviously imbued with a more grave, imminent sense of danger. Perhaps to the dismay of some, this new album is anything but a carbon copy of Blood in our wells; instead it represents what a similar approach leads to 10 years down the line. Released in the midst of a civil war, A furrow cut short offers a much grittier take on Ukraine’s misfortune than did Blood in our wells, yet the album is mature enough to at all times resist indulgence in banal political demagoguery. Quite literally, this is black metal from the frontline, and it demonstrates why separating black metal from politics is a futile exercise, while simultaneously proving that judging bands solely on their political leanings is an activity best left to simpletons who fail to look beyond what is acceptable in their microcosm of thought. It remains difficult to say anything about the Ukrainian crisis without feeling the urge to subsequently disarm said statement with half a dozen of nuances. In a morbid acknowledgment of its own etymology, Ukraine has become the unfortunate frontier of a clash between powers many times bigger than itself. While principally a proxy war, the day-to-day reality of the Ukrainian conflict rather exhibits itself as a vulgar fratricidal struggle that cuts through cities, through friendships and even through families. Distorted by mountains of propaganda that cynically reap the benefits of the information age, allusions to this conflict more often than not play right into the hands of those sinister forces who seek to create a unipolar narrative of the conflict at hand. Whether it is the mention of the alleged neo-Soviet tendencies of the Putin regime or the reduction of the Ukrainian nationalist cause to nefarious neo-nazism, both sides of this battle regularly commit themselves to hysterically stripping their opponents of any possible validity. Regardless from whether such sensationalism takes the form of burning Ukrainian flags or pedestalising the AZOV Batallion through flashy fashion attributes, it ignores the reality that the war in Ukraine, rather than a heroic struggle that only sees the evil fall into their graves, is principally a European tragedy. Ultimately, it is only this tragedy that prevails. And you are a knight, who has been captured! Oh my knight, who has been punished for his sleep! Does not dart off from the earth into the blue of serene day? This fragment shows that, while Drudkh is obviously a nationalist band , these sentiments do not tempt the group to express chauvinist rhetoric. Rather, the love for the motherland here results in harsh criticism directed toward those who have grown too used to comfort; those who have become too complacent and arrogant to realise their freedom cannot be taken for granted. It is exactly this disillusion that carved the melancholia that permeated Blood in our wells from start to finish. Correspondingly, it is the mourning of what once was that gave birth to the beautiful nostalgia of early Drudkh albums such as Forgotten legends and Autumn aurora, beautiful because the lamentation of that which has been lost is still remembered for its immortal allure. Where later albums such as Microcosmos and Eternal turn of the wheel thrived on the natural themes with which the band rose to prominence, A furrow cut short follows the path of the older releases The Swan Road and Blood in our wells by (subtly) delving into political themes. However, where those early albums still allowed for a historically motivated, somewhat abstract take on such topics, A furrow cut short sees Drudkh adopt a more contemporary, serious posture toward the state their country finds itself in, reflecting the desperate, embittered urgency that you would expect to emerge from a country locked in a battle against all odds. Drawing inspiration from the wells of the Scandinavian masters of old more obviously than they have done in the past 10 years, A furrow cut short marks the band’s return to the classic black metal sound it had started to abandon around Microcosmos. Blastbeats drone in abundance, as the tremolo riffing goes through more twists and turns than ever before, offering a comparatively high degree variation where Drudkh traditionally relied on simple, continual riffing to create entrancing atmospheres. In terms of the performance itself, A furrow cut short also embodies a redemption of sorts, as the sloppy instrumentation and production that marred the quality of such releases as Estrangement and Eternal turn of the wheel is washed away with a balanced mix which allows each of the musicians to properly exhibit their talents. It is mainly band member Kretchet who reaps the benefits of this equilibrium, as his bass flows over the wailing guitars with just the right amount of autonomy: free enough to embellish the music, but never so frivolous that it becomes a distraction. He provides the edge to help transform segments such as the instrumental mid-sections of “To the epoch of unbowed poets” into stellar moments of overwhelming nostalgia tantamaunt to Blood in our wells‘ most dramatic passages. Thematically, the band’s more technically refined take on its own formula is logical, as rather than meandering through the change of seasons, the allure of autumn or the majestic grace of the Carpathians, Drudkh now concerns itself with the imminent fate of Ukraine. A furrow cut short is a call to arms, and it is the characteristic wartime efficiency that comes with this purpose that transforms this album into something much darker and more harrowing than any work the band conjured before. Granted, the source material of the lyrics is still at least decades old, and it tends to refer to events that took place centuries ago. Cossack honour, the struggle to free the Slavic nations from the Tatar yoke: it is all still present. But where such references may before have seemed abstruse odes to a forgotten past, obligatory props of the nationalist aesthetic, they are now harshly dragged into reality by the circumstances in which they present themselves. This music can no longer afford to mull over one thought for extended periods of time. The relatively large amount of ideas on this release, in combination with its longer-than-ever running time and tight performance communicate the neccesity that radiates from Drudkh‘s art more glowingly than we have seen in a decade. Ukraine’s descent into chaos last year retrospectively provided Drudkh‘s back catalogue with an ominous aura already, and A furrow cut short firmly underlines the band’s prognostic qualities while at the same time not devolving into politicised vulgarity. Here, Drudkh shines most brilliantly, as the mundane and the transcendental are briefly allowed exist on the same plain; we are confronted with a brutal reality, but in the serene blue sky above we catch a shimmer of the mythical, of that which is beyond our imagination; this music is a perpetual dance between despair and hope. Black metal exists at the mercy of ambiguity, which is why recent attempts to distill from this genre a set of one-dimensional literalities is detrimental to the style’s appeal. Conversely, this also means that any attempt to incorporate the political into the genre should be carried out with utmost delicacy; not because we should at all be concerned with the fickle emotional balance of the easily offended, but for the precise reason that black metal has the potential to be so much more than the mouthpiece of opportunistic propagandists. A furrow cut short is an excellent example of an album that comes with its own set of undeniable political connotations without hinging on them nor shouting mundane statements into the faces of the listener. As a Ukrainian band that has always been vociferous about the love for its homeland, it does not take a political mastermind to figure out where Drudkh stands in regard to the conflict that has entered their borders. And even if it would, song titles such as “Dishonour” and “Until foreign ground shall cover eyes” should be enough to explain the album’s content against the looming backdrop of brotherly onslaught. In spite of the lucidity of this political context, the audience is never patronised or alienated for the pursuit of gratuitous political sermons. What Drudkh does is something far more valuable; something that testifies of the group’s merit as artists. While they do not shun the reality at hand and in a sense place us right in the middle of this reality they go on to relieve us from it. Drudkh aspires to something more universal, more eternal. Drudkh at its best is capable of summoning images of desolate Slavic landscapes, of warring Cossacks, of nature’s unbound force – awesome in the literal sense. Whenever the band is touched by true genius, it has the ability of encapsulating in its riffs the totality of human existence. For a long time, it seemed as though Drudkh had become increasingly estranged from said genius, but on A furrow cut short, this relation is restored, or rather renewed, as this record does not fall back on victories past, but instead learns from them all the things necessary to achieve glory of its own. At this height, thick layers of fog cover the cruel battlefield from which we ascended. Any attempts to deduce from Drudkh‘s music petty political platitudes are an insult to their art, for it embodies so much more. Even so, the political background against which A furrow cut short is presented to us cannot be ignored. This album’s grievous ferocity injects the compositions with the sort of fatalism that springs from desperation, rather than the ruinous malevolence that is commonly associated with other flavours of black metal. It very much sounds like a final piece of music recorded before the band dissolved and its members went into battle, like the warrior-poets of old. Let A furrow cut short thus serve as a vivid reminder that the events which are unfolding on our moribund continent indeed constitute a tragedy. Granted, tragedy may leave fertile ground in its wake, and even if this will prove not to be the case in Ukraine, at least Drudkh‘s art is eternal. But the thought that this music reaches us from a country that may in a few years no longer exist, is utterly depressing. Vae victis. Regardless of any politically correct statements commissioned by Season of Mist, this fact should be obvious to anyone who can read between the lines. And even to those who cannot – Blood in our wells is dedicated to Stepan Bandera, after all. However, the reader should also realise that the true meaning of nationalism has nothing to do with feelings of superiority over other peoples. Drudkh and Our Mythical Origin – Our review of Drudkh‘s album Blood in our wells. “Don’t Enter!” – Drudkh – Three short reviews on classic Drudkh albums. This new album actually kind of gives me a Graveland vibe, specifically thinking “Thousand Swords” to “Following the Voice of Blood” if a great deal cleaner. The weird snakey clanging riffs, off-kilter militaristic rhythms and epic sprawling songs remind me of those two LPs. 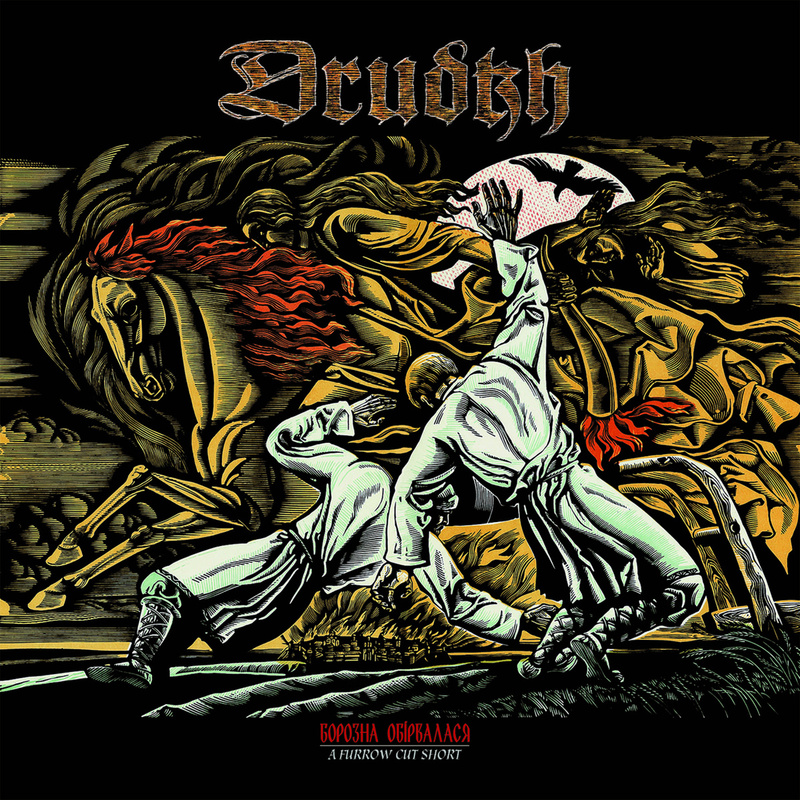 That, and it being way more aggressive than most other Drudkh albums – like old Graveland it sounds like the band members drink wine out of skulls and fight Crimean Tatars on horseback in between recording sessions.